I like to observe the sky at least once every day that I can, even if it is just for a few minutes. Often that entails observing the Sun through filtered telescopes and sketching the sunspots and prominences in my logbook. 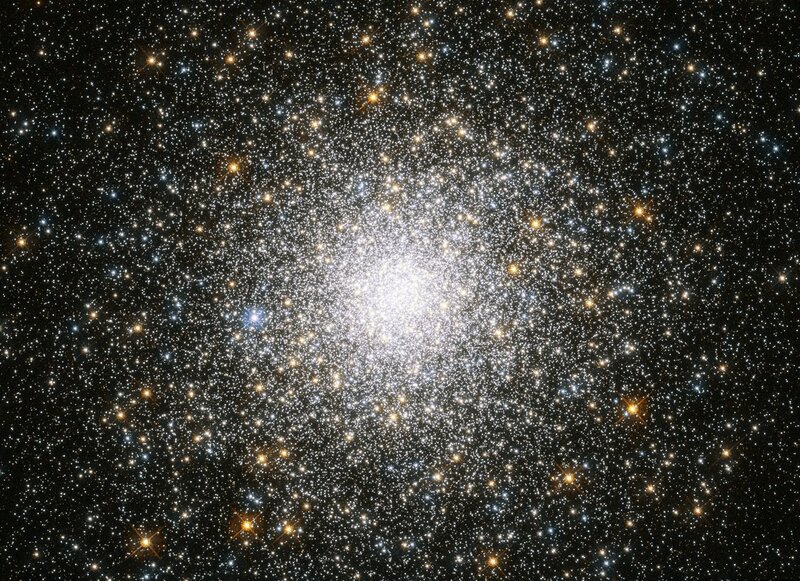 At night if I don’t feel like taking out a telescope I grab binoculars to perhaps see a comet or Mercury, or more often I tour the brighter star clusters. 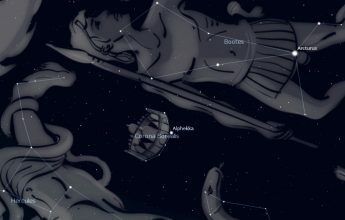 The winter constellations, which are prominent now in late evening, are home to many star clusters within easy reach of binoculars. I usually start with the best open cluster, the Pleiades (M45) in the shoulder of Taurus the Bull, and focus the binos on its stars. The large V-shaped Hyades cluster, catalogued as Melotte 25, is nearby forming the face of the bull. It is anchored by orange Aldebaran at one corner, but that star is not really part of the cluster because it is less than half the distance to the others. The brightest star in nearby Perseus, Mirfak, is part of a group of stars called Melotte 20 that resembles a miniature version of the constellation Draco in binoculars. 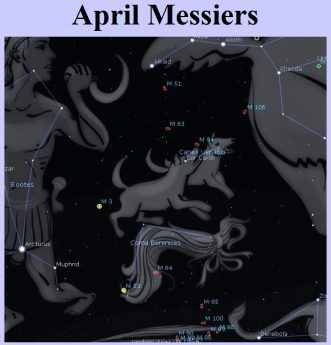 Perseus also holds the star cluster M34, which appears as a fuzzy patch in binos due to its distance. Between Perseus and Cassiopeia is a scenic close pair of clusters, NGC 869 and NGC 884, aptly called the Double Cluster. Saturday’s sunrise in Moncton is at 7:12 am and sunset will occur at 4:52 pm, giving 9 hours, 40 minutes of daylight (7:15 am and 5:00 pm in Saint John). 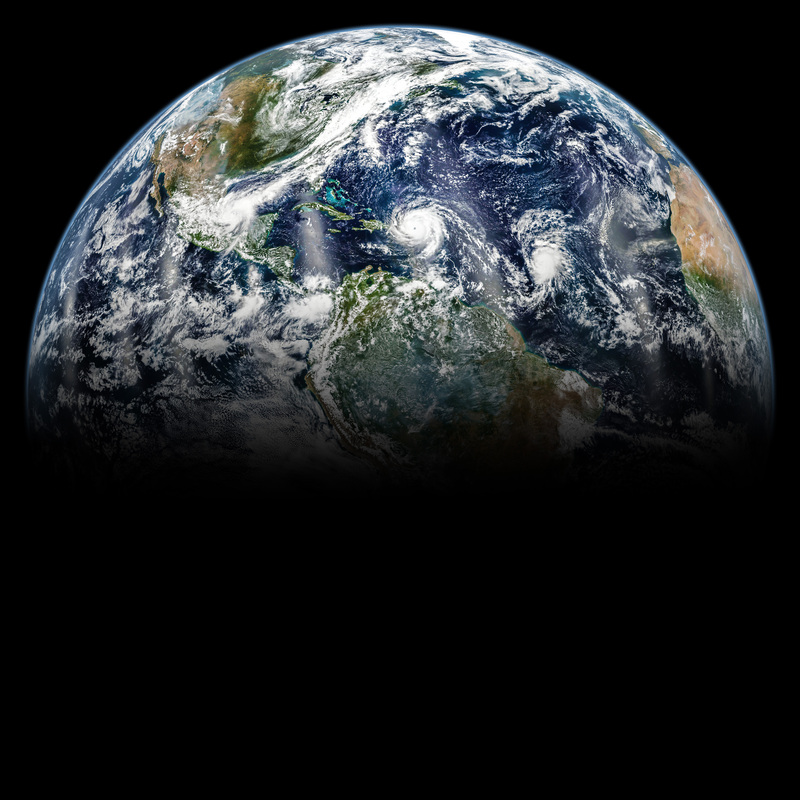 Next Saturday the Sun will rise at 7:22 am and set at 4:45 pm, giving 9 hours, 23 minutes of daylight (7:25 am and 4:52 pm in Saint John). 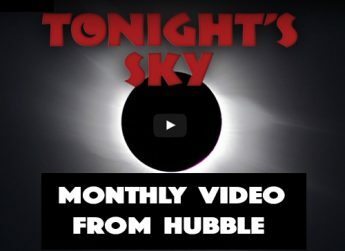 The Moon passes near Saturn this Sunday and it is at first quarter on Wednesday. 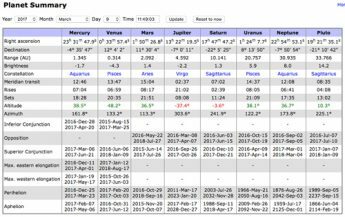 Jupiter and Mercury are difficult targets very low in the southwest, setting 30 minutes and 50 minutes after sunset, respectively, by midweek. 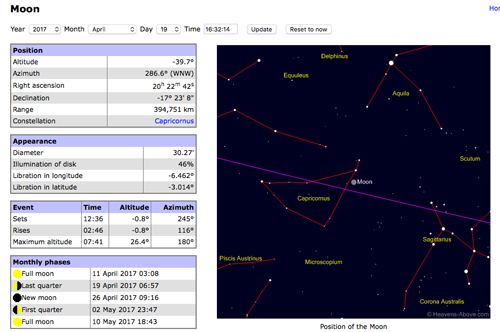 Saturn is at its best viewing in twilight, while the rapid eastern motion of Mars keeps in in good observing position most of the evening. Brilliant Venus is catching the morning eye now, rising more than two hours before the Sun. 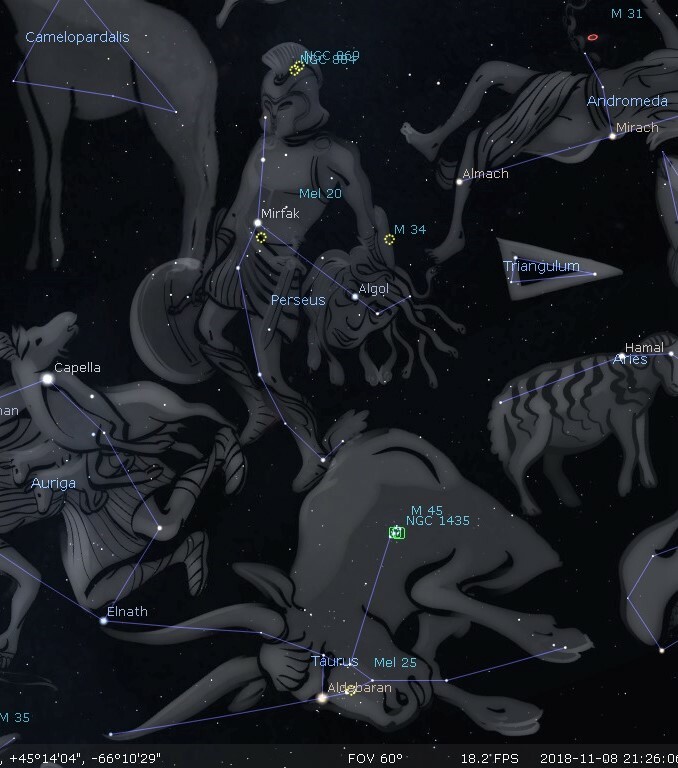 Early risers or late-night revellers might notice an occasional shooting star coming from Taurus on Monday as that is the peak of the minor North Taurid meteor shower. The Leonids meteor shower peaks the following weekend and, although the numbers are expected to be low, it does tend to produce brighter meteors called fireballs. 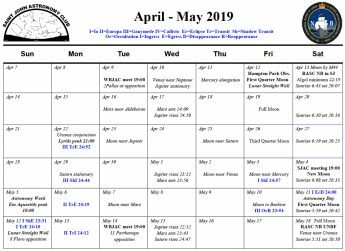 The William Brydone Jack Astronomy Club meets in the UNB Fredericton Forestry / Earth Sciences building this Tuesday at 7 pm. All are welcome. 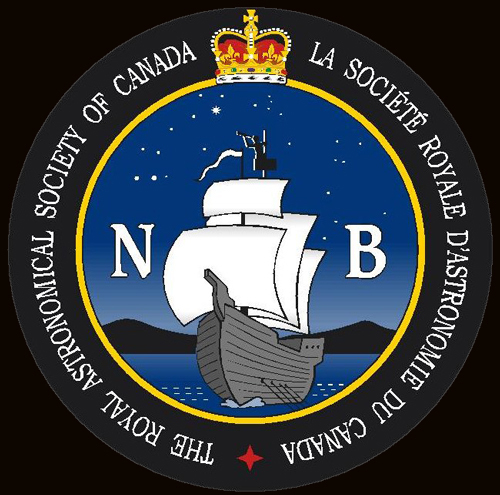 The Royal Astronomical Society of Canada (RASC) is one of the oldest and most respected organizations devoted to the advancement of astronomy and related sciences. It is a national, non-profit, charitable organization with 29 branches (known as Centres) across Canada. 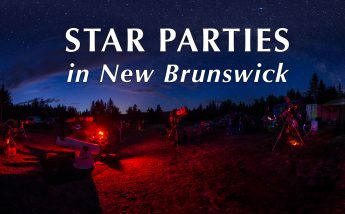 RASC NB (New Brunswick Centre), the Provincial branch of the Royal Astronomical Society of Canada. 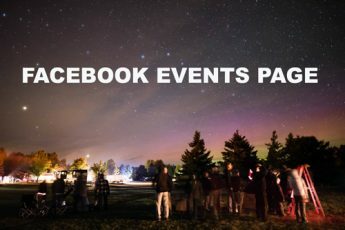 It shares astronomy through meetings, presentations, outreach, star parties, observing sessions, literature and media. Header photo by Paul Owen. 60mm hydrogen alpha solar telescope using a high frame rate CCD camera . 1000 frames stacked together in RegiStax, post processing with Photoshop.